Ruth: Waiting on God's Timing ~ Welcome! 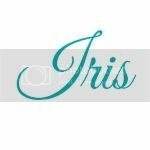 Hello Iris, I am really looking forward to sneaking away from the chaos this month in order to read your blog. This is Angela Parr - your sister-in-law who wishes you lived even closer to me in Nova Scotia. (But thank you for moving 3000 kms closer!) To introduce myself, I am definitely not a night owl. If I came with an instruction manual it would read, "is fully-functional at 9 hours sleep per night." My favourite colour is red, but somehow I don't own any clothes in that colour. Strange. Can't wait for the study to begin tomorrow - on my 13th anniversary! I love it that you're here, Angela! It will be so good to get into the Word together. Happy Anniversary! Hello everyone. Welcome! It's so good to have you here. I hope to see more introductions in the next week. I really have very little idea who is joining us ;) It's very exciting, really. Where am I from? A long answer if we would really get into it, but the basics are this: I am a Paraguayan born, Manitoban, just moved away from northern Alberta girl, who just moved to southern Ontario. I am a lot like Angela in that I am NOT a night owl. I too need a lot of sleep to function well and have learned, by default (a little girl who has not slept well since she breathed her first breath), that I can function on very little sleep. My favourite colour is probably green if I had to choose, but somehow I own a lot of black. So great to have you hear. Please introduce yourself. I am sometimes a morning person and sometimes a night owl depending on the seasons of my year. I'm a school secretary currently on summer break and can stay up late, sleep in and take a nap in the afternoon - if I need to ... but all that will change in 2 weeks when I go back to school. I love the color green - olive, fern, forest, dark and tea greens. I also enjoy purples - mauve, lilac, plum, lavender and mulberry purples. 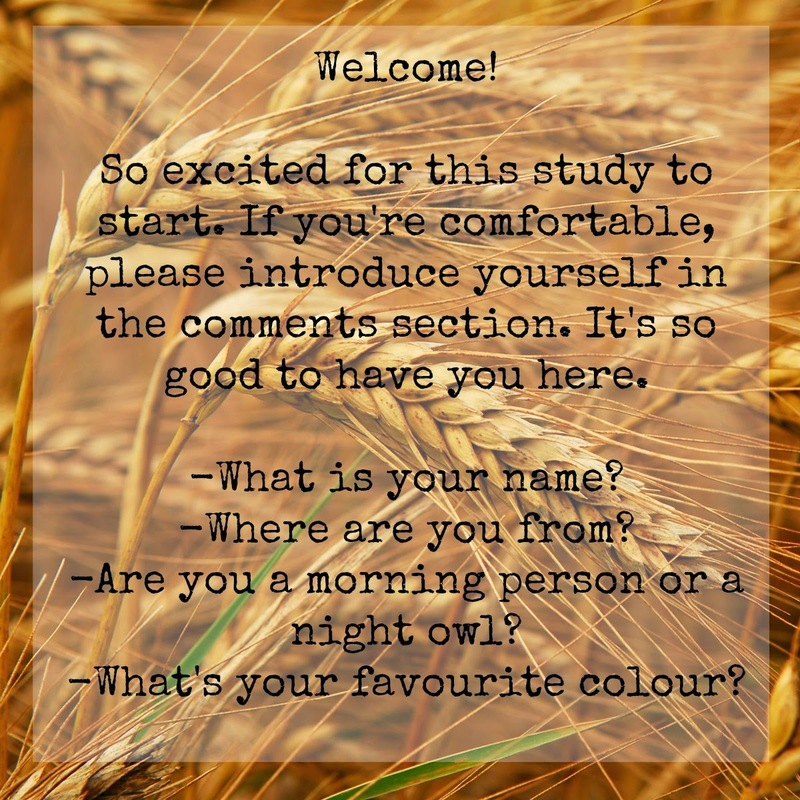 I am looking forward to getting to know all of you through this study. Welcome Cathy! It's wonderful to have you here! Hi Iris, You will remember me from our job sharing gr. 1 at Wembley. I love your blog and look forward to this study. I am also on summer break and am a night owl until school begins again and the alarm sounds at 5:45. Turquoise is my favourite colour. This is an ingenious way to do a bible study. It is interesting how becoming friends on facebook led to this wonderful opportunity! Hi Cindy! So great to have you join us over here. Funny how we are connecting again now after I move away from the GP area. Isn't technology wonderful? My name is Yvonne and I am a friend of Angela Parr's. We've been in a mom's group Bible study together this year, but are taking a break for the summer, so this is a great opportunity to spend some time reading and studying God's word. I have a 13 month old daughter named Ottilia who has a great sense of humour and gives us a lot of joy. I am a nurse and have just returned to work and my mother just moved into our basement apartment to look after Ottilia when I'm working, so we are all adjusting. I am originally from Ontario and have been in Halifax for the past three years. I'm a night owl, but like Iris and Angela, also need a lot of sleep! Which doesn't work out very well when I go to bed late, our girl is up during the night and then up for the day before 7am. I want to go to bed earlier and even though I'm not a morning person at all, I do enjoy being up in the wee hours of the morning and having the whole day ahead of us. I dont' like picking favourites, but I'll say coral for my fav colour. Welcome, Yvonne. I am so glad that you are here. The name you picked for your daughter is beautiful!